Now 20-2 after his recent fantastic knockout of Edson Barboza in the UFC Philadelphia main event, “The Highlight” continues to live up to his nickname and solidify himself as arguably the most exciting MMA fighter of all time. The former World Series of Fighting lightweight champion has proven time and time again that it doesn’t matter who is put up against him, he’ll go out and deliver a fight that won’t soon be forgotten. More often than not, that can also be said for the 30-fight UFC veteran, Jeremy “Lil Heathen” Stephens. And after seeing Gaethje continue on with his entertaining winning ways, he said “sign me up” in response to the UFC’s Instagram post asking who should be next for the UFC Philadelphia main event winner. For the now 32-year old Stephens, he began his career at lightweight but made his featherweight debut in 2013 and that’s where he has fought since having gone 8-7. Stephens currently rides a two-fight losing streak that has seen him suffer defeat at the hands of the all-time great former featherweight king, Jose Aldo, and the rising Russian prospect, Zabit Magomedsharipov. His last bout with Magomedsharipov took place at UFC 235 at the beginning of March. Stephens lost by unanimous decision. 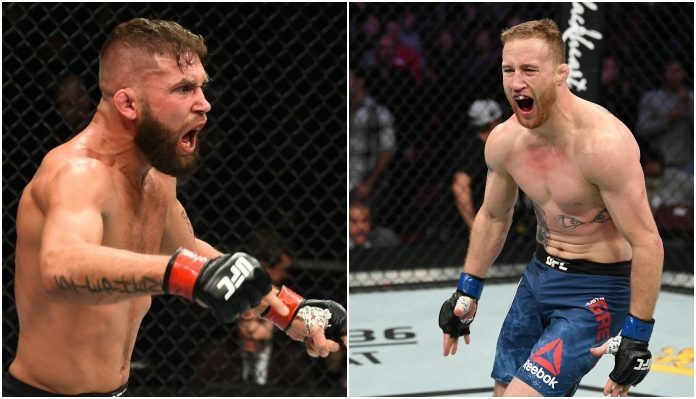 With his win over Barboza, Gaethje got himself back onto a winning streak after suffering his first two career losses to former UFC champion, Eddie Alvarez, and Dustin “The Diamond” Poirier who will next be competing for the interim lightweight crown at UFC 236. His opponent will be current featherweight champion, Max Holloway whom Poirier defeated in February 2012 when Holloway made his promotional debut. It’s pretty unlikely that we see a match-up between Stephens and Gaethje next. But hey, the UFC did recently make Stephen “Wonderboy” Thompson vs Anthony Pettis.